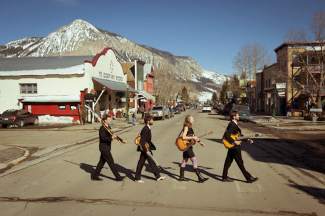 Doctor Robert will play a free show at three20south in Breckenridge tonight. Doctor Robert is a new generation of Beatles tribute band, with a commitment to the accurate reproduction of more than 100 songs of The Beatles’ repertoire. Doctor Robert plays extended sets of music ranging from “Please Please Me” to “Abbey Road,” with no two set lists ever being the same. The band’s high-energy shows are full of Beatles magic, as Casey Falter, Karen Janssen, Ben Wright and Kevin Reinert love the challenge of re-creating even the most demanding musical compositions live onstage. Doors open at 9 p.m., and the music starts around 10. For more information, call (970) 368-3204 or visit http://www.three20south.com. Alma’s Only Bar will be dancing to the sounds of future-pop group Synapse on Friday. “This gig is a bit out of place for us; as a primarily dance act we are used to larger scale urban nightclubs,” said Mark Sousa, of Synapse. “We like to mix things up every now and again and perform outside of our element. You can expect a high-energy performance but with an intimate quality. … I love playing ski towns. The last time we did this, there was a group of people who actually threw money at us, not just for a moment either, these people actually threw cash at us for most of our set! What a life we lead.” The show starts at 9:30 p.m., and there is no cover charge. Visit http://www.almasonlybar.com for more information. The Barkley Ballroom will host a sit-down show with candlelit tables on Saturday, featuring Jon Wirtz’s Nuskool. While accumulating a diverse brew of influences as a respected sideman in almost every genre, Wirtz had a desire to put together a modern sound fueled by improvisation, groove, risk-taking and a more roots and soulful feel. Enter Nuskool. Blending the unique sounds of jazz, the deep grooves of hip-hop and R&B and the intimacy of folk, Nuskool is a modern-day trio whose sound continues to evolve with every moment of each performance. Doors open at 8 p.m., and the show starts at 9. Tickets are $10. Visit http://www.barkleyballroom.com for more information. Nevermind the 90s will take the stage at the Snake River Saloon in Keystone on Saturday. Nevermind the 90s is a tribute to all the great music of the 1990s, with classic hits from all decades mixed in to keep the party rocking all night long. The band provides a high-energy, dynamic performance for any occasion and has been performing in venues all across Colorado for years earning new fans everywhere it goes. Doors open at 4 p.m., and the music starts at 9:30. Call (970) 468-2788 for more information. Three20south in Breckenridge will be bumping to the beats of Tatanka on Saturday night. Homegrown in Denver, Tatanka is a quartet specializing in dub, progressive reggae, dancehall and electro soundscapes. Heavy Caribbean drum and bass grooves provide the pulse for the party as the music invites you to get down and dirty. Dub Rock Syndicate recently gave the boys the title “the up and coming kings of dubtronic.” Doors open at 9 p.m., and the music starts around 10. The cover is $6. For more information, call (970) 368-3204 or visit http://www.three20south.com. The Make a Sound Tour will stop at The Barkley Ballroom in Frisco on Tuesday. The Make a Sound Project was born out of desperation. “We believe that one touch, one glance, one sound can make a difference in the life of someone who feels that they mean nothing in this world,” states the tour bio. “We have felt the pain and loneliness of youth who want so desperately to be seen yet they are too wrapped up in drugs due to feeling they are nothing but a bother to their families.” The three bands featured are Archers & Illuminators, Silversyde and At The Wayside, and the free show starts at 9 p.m. Visit http://www.barkleyballrom.com for more information. AfroZep will play a free show at three20south on Tuesday. AfroZep plays high-energy afro-beat and afro-pop versions of Led Zeppelin songs, complete with horns and percussion. Formed with Chicago’s top rock, jazz and African musicians, AfroZep perform some tunes as straight mash-ups of Fela Kuti and Zeppelin; others are Zep tunes but set to original grooves based off the music of artists such as Tinariwen, Thomas Mapfumo and Franco and others are stripped down Zeppelin arrangements injected with the pulse of traditional African drumming. Doors open at 9 p.m., and the music starts around 10. For more information, call (970) 368-3204 or visit http://www.three20south.com. The Honey Island Swamp Band will play a free show at the Gerald R. Ford Amphitheater in Vail on Tuesday as part of the Hot Summer Nights concert series. Formed in the aftermath of Hurricane Katrina in San Francisco, Honey Island Swamp Band has developed into one of hottest new bands coming out of the South. The band includes Aaron Wilkinson on vocals, mandolin, guitar and harmonica; Chris Mule on vocals, and guitar; Sam Price on bass and vocals; Garland Paul on drums and vocals; and Trevor Brooks on keys). The band takes the stage at 6:30 p.m. Visit http://www.vvf.org for more information. Missed the Boat, hailing from Steamboat Springs, will play a free show at The Barkley Ballroom on Wednesday. The band features acoustic guitar, mandolin, banjolin, electric bass, drums and harmonica. With this dynamic combination of instruments, the band has a high-energy sound, with roots of folk, bluegrass and rock. From lonesome High Country bluegrass to Americana-fed rock ’n’ roll, Missed the Boat is truly a Colorado music experience. Doors open at 9 p.m., and the show starts at 9:30. For more information, visit http://www.barkleyballroom.com. Big Medicine Gang will rock three20south on Wednesday, along with The Mike Dillon Band. Big Medicine Gang’s high-energy original sound is a mix of blues, funk and reggae. They conjure an old-school sound reminiscent of Peter Green’s Fleetwood Mac, Sam & Dave and Led Zeppelin, as well as a healthy dose of reggae fueled by Sublime, The Wailers and the Skatalites. Mike Dillon is one of the most dynamic, multifaceted, electrifying percussionists in the country. Doors open at 9 p.m., and the music starts around 10. There’s a $5 cover. For more information, call (970) 368-3204 or visit http://www.three20south.com. Breckenridge band Salem will play a Fourth of July show with the Dirty Dozen Brass Band at the Dillon Amphitheatre on Thursday. Salem performs Todd Anders Johnson’s socially conscious compositions, blending funk, hip-hop and electronica. Salem has been traveling with Risan Project tours, which include Salem concerts, ski and snowboard film premiers and presentations from environmental organizations such as Protect Our Winters, the Nantucket Land Council and The Climate Project. Salem goes on at 4:30 p.m. For more information, visit http://www.townofdillon.com. Tea Leaf Green will play The Barkley Ballroom on Thursday. The members of San Francisco’s Tea Leaf Green are newfangled Lost Boys, a traveling gang dedicated to seeking wisdom and experience in places both glorious and seedy. In many ways, this quintet is the essence of rock’s adventurous, playfully outlaw spirit, all of which ultimately fuels songs that resonate with classic vibrations, open-ended possibilities and radio-ready charm. Doors open at 8 p.m., and We’s Us kicks off the music at 9:30 p.m. Tickets are $13 in advance and $15 day of show; visit http://www.barkleyballroom.com for more information. The Dillon Dam Brewery will host an open mic night with Arnie J. Green on Thursday for qualified musicians age 21 and older. Jam on some rock and R&B and other creative tunes with this local legend. Call (970) 262-7777 for more information.